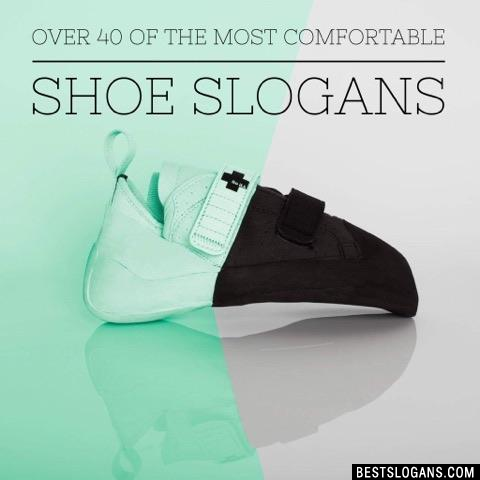 41 new entries added to shoe slogans, that include pictures. 1. Shoes for Actives. Performance with comfort. 1 Shoes for Actives. Performance with comfort. 2 Healthy shoes. Naturally beautiful. 3 Beauty treatment for your feet. 4 Better little shoes are not made. 5 See how good they feel. Almost a part of you. 14 Lets make Excellent Happen. 15 Put your spin on it. 18 Worn by the worlds most precious feet. 20 The World Finest Shoes. Can you think of a good Shoe Slogans we're missing? Or come up with a clever one of your own. Please share below.